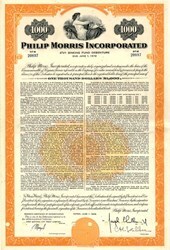 Beautiful certificate from the Phillip Morris Incorporated dated in 1959. 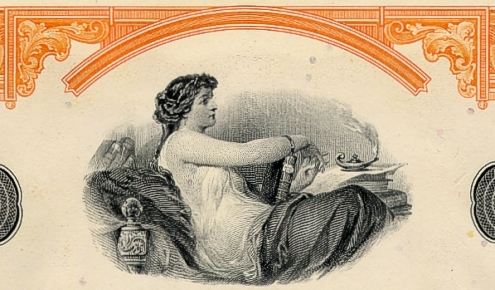 This historic document was printed by American Banknote Company and has an ornate border around it with a vignette of an allegorical woman. This item has the signatures of the Company's President and Secretary and is over 49 years old. Coupons attached on right side. Altria Group, Inc. (NYSE: MO) (previously named Philip Morris Companies Inc.), based in New York City, is the parent company of Philip Morris International, Philip Morris USA, John Middleton, Inc. and Philip Morris Capital Corporation, and is one of the world's largest tobacco corporations. In addition, Altria Group, Inc. has a 28.7% economic and voting interest in one of the world's largest brewing companies, UK based SABMiller plc. It is a component of the S&P 500, and was a component of the Dow Jones Industrial Average until February 19, 2008. On January 27, 2003, Philip Morris Companies Inc. changed its name to Altria Group, Inc. On March 30, 2007, a spin out of Kraft Foods subsidiary (publicly traded since 2001) was concluded through distribution of the remaining stake of shares (88.1%) to Altria shareholders. As a result, Altria no longer holds any interest in Kraft Foods.